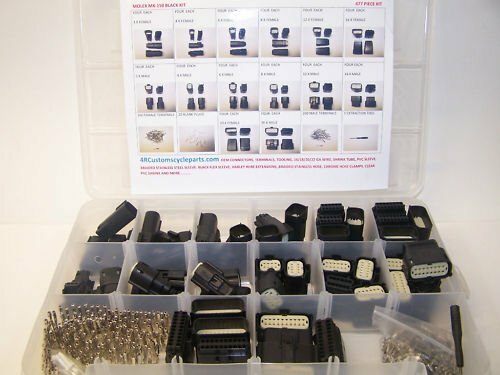 This is a 477 Piece kit With: 28 FEMALE CONNECTORS, 28 MALE CONNECTORS, 20 BLANK PLUGS, 200 FEMALE TERMINALS, 200 MALE TERMINALS, 1 EXTRACTION TOOL, Box. Molex Black and Gray Connectors are not interchangeable, We also have gray kits available. They are the OEM connectors used on Harley Davidson, Caterpillar and many other cars, trucks and equipment. We use them mostly on handlebar switch wiring from 1982-2006. If you have any questions about this product by Molex, contact us by completing and submitting the form below. If you are looking for a specif part number, please include it with your message.